Mensusa https://www.mensusa.com/articles/navy-tuxedos-are-the-best-options-for-all-occasions.html Navy Tuxedos Are The Best Options For All Occasions Tuxedos are undoubtedly the most sophisticated attire that anyone can wear whatever may be the event. A well-fitted tuxedo is the first preference of style-conscious men. However, there are certain colors that work wonderfully well like the navy tuxedos to portray uniqueness and style. Nowadays innumerable colors and designs of tuxedos are available at the stores created to cater to the various needs of the customers. Apart from the blacks and whites, navy tuxedos have gained great popularity because of their versatility. Men wearing navy tuxedos naturally draw the attention of all around. Tuxedo suits are basically very elegant and sophisticated. They were the staple attire of affluent men in the past. But nowadays, innovative designs and fabrics are used to make tuxedos available to all categories of people. It is an established fact that each and every color has something to say about the wearer's personality and preferences. Hence, individuals who are style conscious, always have navy tuxedos in their wardrobes so that they are never out of style. Navy tuxedos are just the must-have attire of every fashion conscious individual. This is because, the shade is extremely attractive and at the same time sober and dignified. It looks good on every skin tone and enhances the wearer's looks irrespective of age. If you can choose the perfect fit, you are sure to create your own style statement wherever you go. The blue shade portrays serenity and a responsible attitude that gives the wearer an edge over others at all events. It does not matter what dress shirt you wear, the navy tuxedos work efficiently to bring out your personality and give you an awesome look. When you think of rearranging your wardrobe, visit MensUSA for the finest collection of navy tuxedos. You will get the single-breasted, slim-fit, and double-breasted tuxedos in amazing designs. Some are ornamented with golden buttons, some with brass buttons. You have to select according to the occasion as well as the season when you are going to wear the navy tuxedos. But always remember to get the accurate fitting for all the show depends on the fits of your outfit. At MensuSA you will get the opportunity to customize your tuxedo suits if they do not fit you well. This facility makes the suits look as if they are bespoke suits and have been stitched exactly according to the individual's measurements. Sophisticated men are extremely fond of navy tuxedos as they help to portray their personality and status wherever they go. Moreover, the navy blue color is alluring and versatile and matches with many other shades. So you can easily combine your navy tuxedos with other suit separates to create a new look every time you step out of your house. If you own the exclusively designed navy tuxedos you can rest assured that you will never fall short of clothes and will always be at par with the moving fashion trends. 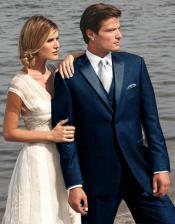 If you want to look different from others, get the fantastic navy tuxedos from MensUSA and express your unique style.